Kate Constable's Blog: Changing History? The indefatigable local author Goldie Alexander has produced three books based loosely on Shakespeare. I went to the launch and picked up this one, though I was strongly tempted to buy the anthology which contains all three volumes, including Gap Year Nanny (based on Macbeth) and The Trytth Chronicles, which transplants The Tempest to outer space! After lapping up the sumptuous series Babylon Berlin earlier this year, and now embarking on Ku'damm 56 (set in Berlin in the 1950s), I seem to be going through a Berlin phase. 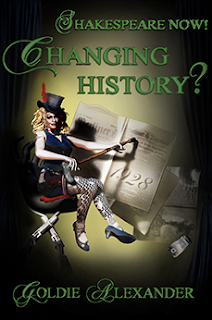 I especially enjoyed the period detail of Changing History? which cleverly drops plenty of historical information into the novel without overwhelming the human story. Taylor learns to appreciate her modern creature comforts, while picking up the political parallels with our own time. This book might even be more useful to students of modern history than those studying Shakespeare!